TeachMeets are free events and this one is no exception. You can still purchase tickets here If you register but cannot attend you will be able to watch the event as it is being streamed live. All you have to do is select online tickets when you book. I am presenting my work on Roamer in the literacy lesson. 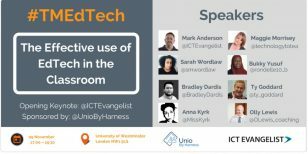 Obviously I am looking forward to showing this work, but it is also a great chance to meet other enthusiastic Edtech teachers. I will add more details about the event on Friday and over the weekend. Further pictures and comments are to appear here shortly. Since qualifying as a Primary school teacher in 1999 I have worked in large multicultural primary schools within the London area. In my first degree I initially trained as a primary science specialist but became interested in how technology can enhance learning in both science and other subjects. I then went on and coordinated ICT within the schools that I taught.